[EN] Drummer of the band dUASsEMICOLCHEIASiNVERTIDAS and noise therapist of the A.T.R. 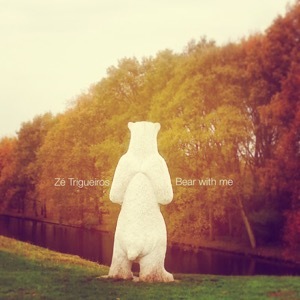 collective, Zé Trigueiros shows us for the first time a set of homemade songs, created in recent years between trips and stops… A melancholic instrumental work, which has the collaboration of the musician and luthier Domenikos de Visser on the bass and tzouras, “Bear With Me” was recorded in 2014/15 at his home in Amsterdam. [PT] Baterista da banda dUASsEMICOLCHEIASiNVERTIDAS e terapista do ruido do colectivo A.T.R., Zé Trigueiros lança o seu album de instrumentais melancolicos e cinemáticos, em colaboração com Domenikos de Visser no baixo e tzouras. "Bear With Me" foi rgavado em 2014 e 2015 na sua casa em Amsterdão.